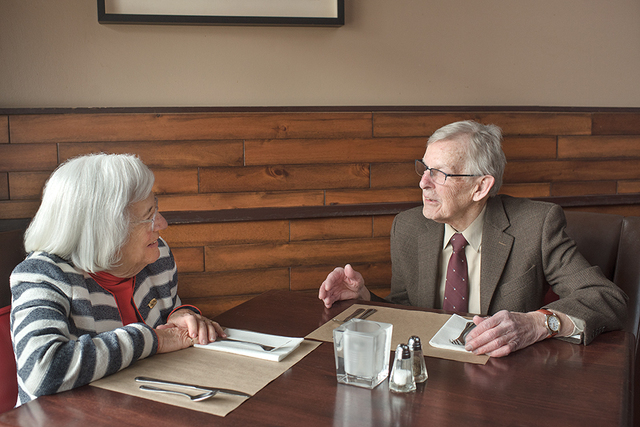 Gordon DeJong, having lunch with Town&Gown founder Mimi Barash Coppersmith at The Deli Restaurant, says there will be 200 voices on the stage for the State College Choral Society’s 70th Anniversary Gala Concert on April 28 at Eisenhower Auditorium. A longtime financial supporter of the State College Choral Society, Gordon DeJong has served on the organization’s board for eight years. He also sang in numerous Choral Society concerts, including two touring choirs to Europe. DeJong and his wife of 57 years, Caroline, have established the DeJong Oratorio Performance Endowment fund at the Centre Foundation to perpetuate future performances of major choral works by the Choral Society. This fund will help ensure the Centre Region will continue to experience and enjoy the arts through major choral music presentations. DeJong is a distinguished professor emeritus of sociology and demography at Penn State University. He is also the founder and former director of the graduate program in demography. Although retired, he continues to work on National Institutes of Health-funded research on the health of children of Mexican immigrants. He is also collaborating with a colleague to develop and roll out a new World Campus online master’s degree program in applied demography at Penn State. A native of Kentucky, he earned his Bachelor of Arts degree in sociology from Central College in Iowa, and a master’s degree and PhD in sociology with an emphasis in demography from the University of Kentucky. He also did post-graduate work in demography at the University of Chicago. Town&Gown founder Mimi Barash Coppersmith sat down with DeJong at The Deli Restaurant to discuss DeJong’s 50 years as a member of the State College Choral Society and the organization’s 70th Anniversary Gala Concert, Eljiah by Felix Mendelssohn, on April 28 at Eisenhower Auditorium. The concert will be conducted by Russ Shelley and will feature world-class soloists. Eljiah will be performed in collaboration with the Pennsylvania Chamber Orchestra and special guests, the State College Area High School Master Singers. Mimi: Gordon, it's just a thrill to meet you. I've been watching you for years. I nod to you every time I see you, but I've never known your name before. Gordon: Thank you. It’s a pleasure to talk to you. Mimi: Well, it's fun to be together. We're both in State College for a good many years, and each of us doing a lot of good in our own way. Gordon: We try. You do a lot of good in support of the arts. And that's so important to so many people. Mimi: And especially in support of the State College Choral Society, which has a rich, wonderful history. You’ve been involved in the Choral Society for over 50 years and you're involved in a lot of the good work that has been done over those years. And we have this remarkable concert coming up. Could you tell our readers some of the highlights of that? Gordon: The concert is celebrating 70 years of the Choral Society. It’s really, from my perspective, kind of the crown jewel, predating the Nittany Valley Symphony, and the Pennsylvania Chamber Orchestra by many years. Mimi: It predates most of the existing things, including the Center for the Performing Arts. Gordon: It does. The 70th anniversary concert is the marvelous oratorio by Mendelsohn called Elijah, which is the story of Elijah put to music. So, there will be choruses and soloists from New York, Washington, and Ohio. It's going to be really outstanding because we will be accompanied by the Pennsylvania Chamber Orchestra and the Master Singers of State High. So, there will be about 200 voices on the stage. Mimi: Let's flash back to when you first joined the Choral Society. What was it like? Gordon: Raymond Brown was the conductor. Everybody has stories and Raymond was a taskmaster. He took pity on tenors, which is the part that I sang, because he didn't want to run us out. But he certainly did get quite a bit of musicianship out of what he called mature voices. But he really liked to work with his college kids. And then Doug Miller took over soon after I joined the Choral Society. Doug was our conductor from the early 1970s to nearly 2000. It was just marvelous to sing with Doug, in part because Doug’s strength was in terms of interpreting the lines and the text and making sure that you got across what the musicality was of the piece. Not just the notes, but what was being conveyed. One of the things I really enjoyed that he performed from time to time was Duruflé’s Requiem, which is just lovely, sumptuous music. Mimi: How did you develop your interest in choral music? Gordon: I sang in choir in college and it was in college that I first had an experience singing the Messiah with a choir and orchestra. And I thought, “This is kind of cool.” Here are two musical groups and forms coming together to really make music together. Mimi: The Choral Society has stood the test of time and that suggests it had both leadership and talent. How has it stayed together as an almost exclusive volunteer operation except for the conductor? What's the secret weapon that has had that survive? Gordon: I think first of all, you have to have an excellent conductor because people will not come sing with you if the product is not up to what they think the standard should be. And I think the Choral Society has set a pretty high bar in terms of quality of musicianship. Mimi: Does the Choral Society have a board that help make the decisions for the group? Gordon: It does. We've had good leadership on the board. Successive chairs have provided strong leadership and the members have supported it. Mimi: You’ve also taken on huge challenges. Gordon: We have, and it gets more difficult all the time because Eisenhower [Auditorium] is very expensive to rent and to put on a performance there. Bringing in and paying professional musicians/soloists is a stretch to the budget. But we now have some donors who created endowments. Mimi: Including you and your wife. Gordon: Including my wife and me. This helps because the board can plan on endowment income. But it does mean that we need support from businesses and patrons, as well as members within the group to also sell tickets. If members weren't dedicated, it wouldn't happen. Mimi: And there are people that have been a part of the history. One person I automatically think about is Pat Farrell. Gordon: Pat Farrell was a solid rock of the Choral Society for years. Mimi: It was her life. Gordon: It was. To me, singing choral music is a nice form of relief from more scientific work. You use a different side of your brain and it's a form of relaxation. Mimi: It affects your whole body. Gordon: It affects my whole body, but it affects my spirit as well. Mimi: And you seem like a very calm person; are you? Gordon: I tried to be. I think music is a way that one expresses joy and happiness, but also sadness and grief is often expressed in music, whether it's choral music, classical choral music, or whether it's other forms like country or rock and so forth. Mimi: Music has a message. What is the special characterization of the Choral Society that it has so many devoted participants? Gordon: I think it starts with many people having participated in music when they were younger and this is their opportunity to continue that. The opportunity to sing and instead of singing in a group at a bar, you're singing with a chorus. Our group has usually around 125 singers. We have some people returning to sing this particular concert, which is marvelous. We've done this work in the past. I think in 1997 Doug Miller last performed Elijah. Mimi: Is this the most difficult work you've participated with? Gordon: I think the most difficult work for me was Bach’s Mass in B minor, which Ray Brown did way back when. That went on for over two hours and I just had no voice left. Mimi: Within the history of the Choral Society, you've gone abroad a couple times. Were you on those trips? Gordon: Yes, Doug Miller had trips to Europe. I went on the one to Spain and I went on the one to Eastern Europe. He went every couple of years; they even went to Australia on one trip. I wasn't on that one. It was a marvelous way to bond and sing different type of repertoire. We didn't do an oratorio, a major work like this. We always did some spirituals. In Europe, they really respond well to African-American music and so, Doug would always include some repertoire from spirituals. It was marvelous to contribute to European audiences like that. Mimi: What stands out in your mind as a high point, something worth remembering, in all these 50 years that you’ve been a part of the Choral Society? Gordon: Two things really stand out to me. One was when the Choral Society commissioned and performed the Voices of the Holocaust. The other was after 9/11 when everybody in the country was together and we were grieving and our conductor Russ Shelley quickly pulled us together to sing the Mozart Requiem, and we invited in first responders from the area to be our guests. Mimi: We owe you and all your colleagues and Russ Shelley for continuing the tradition. A whole lot of thanks for making such an impact on the cultural part of our life. Gordon: Come to the concert, you'll enjoy it. The 70th Anniversary Gala Concert, Eljiah by Felix Mendelssohn, will be at Penn State Eisenhower Auditorium at 3 p.m. on April 28. A pre-concert lecture by Dr. D. Douglas Miller, former SCCS music director and Penn State professor emeritus, will be at 2 p.m.
For ticket information, visit scchoralsociety.org or cpa.psu.edu/ticketcenter.